Oh Hello. I just recently bought this plaid top and I realized that it can be worn so many different ways. Here I show you the basic ways but everyone should own a plaid top and in every color and have fun with it! 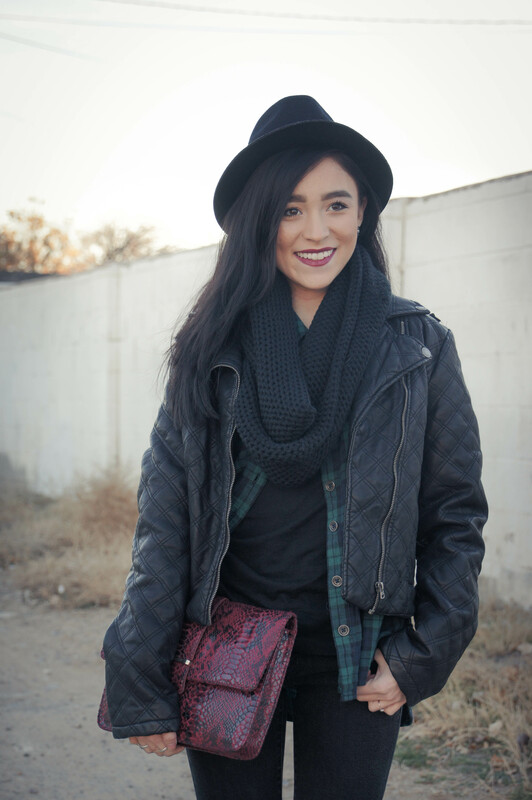 Plaid will never go out of style but it’s definitely a must in the winter months. I wore a more grungy version on plaid today but there are other ways it can be worn like super festive for the holidays. P.s. TREND ALERT. I’ve been seeing a lot of my favorite bloggers and celebrities wearing black skinny jeans with slits in the knees. I didn’t hesitate one second to do a little D.I.Y to mine. You just needs scissors and BAM, you conquered a do-it-yourself project that took literal 2 seconds to do. Loving these pants right now. My ultimate goal in life is to inspire others. Let me know if my outfit posts have inspired you. Use the hashtag #karissamarieinspiredme on Instagram. I would love to see what you come up with! Xoxo, Karissa. So stylish! Loving your shoes and matching clutch bag! Love your post and your blog! So stylish!